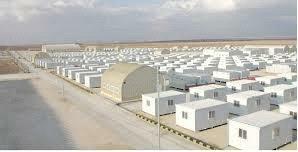 The new Emirati-funded, Mrejib Al Fhood camp is located at Zarqa, 80 kilometres east of the capital, Amman. The camp has been open less than a month but already, it’s receiving an average of 100 new arrivals every day. It covers an area of around 250,000 square metres – roughly the size of 35 football fields and includes 770 trailers set up as makeshift homes. The daily operations of the camp are handled by the UN High Commissioner for Refugees in coordination with Emirati and local officials. The facilities are designed to help the refugees feel at home. The complex also includes a separate boys and girls schools, a mosque, outdoor and indoor markets and integrated health clinics. The camp will also have a water treatment station, solar-powered heaters, a modern irrigation system and family entertainment zone that will include a children’s playground. Comfort is the least they can be offered after what most have had to endure. This woman says the sheer volume of human slaughter is what forced her to leave. They put up with missiles and gunfire but couldn’t remain with the slaughter. The numbers of those fleeing Syria has surpassed UN estimates, the current figure of 1.25 million, is already ten percent higher than was expected by the end of June. Three quarters of those are women and children. With more than 3.6 million people internally displaced within Syria and no end in sight to the two-year conflict, there is every chance that the exodus could keep growing. A new genre in digital entertainment is about to hit our screens bridging the divide between broadcast television and social media. It’s Emirati creators, call it social television, and through it, they will introduce you to people all around the world. You might know Peyman and Mohamed Al Awadhi as the force behind the Wild Peeta restaurant chain but soon they’ll be household names as the roving restaurateurs behind Planet Peeta. Their social television concept came up back in 2009, when they were looking to take a well-earned break from their busy lives and started asking for travel tips online. His brother explains that from that search, their concept of travelling the “ultra-local” way grew. “Mohamed and I are very much of the type, we love the ultra-local experiences, when we travel, we rarely go to the places you’d find on the sites like TripAdvisor and things like that,” says Peyman Al Awadhi. Naturally, that form of travel relies heavily on access to the right type of technology, explains Maha Abouelenein, Google’s regional head of communications. Technology may have helped them tackle the tyranny of distance, but they also had to learn how to cross the cultural divide. It always started a little bit awkward because somebody dressed like this in a foreign country comes across a little bit intimidating and the guest was always wary of what shouldn’t I say and will I offend these people and what happened was with everyone as soon as we started talking, what we looked like and what passports we held just melted away and it was just two people with similar ideas. Coming from an Emirati upbringing also brought some very distinct advantages. Peyman says their goals is to tempt us away from package tours and “sanitised” travel that leaves you disconnected from your surroundings. Hey Qantas, welcome to Dubai! The first scheduled Qantas flight into Dubai touched down this morning – heralding the start of the Australian carrier’s powerful new alliance with Emirates Airline. Noni Edwards has the details. Yesterday, to mark the launch of the alliance, two A380s flew in formation over Sydney – Emirates and Qantas, working in perfect partnership. No doubt that’s the symbolism they’re hoping will stick. At today’s launch event at Emirates headquarters here in Dubai, the Qantas CEO Alan Joyce said that first flight into Dubai was no less than history in the making. 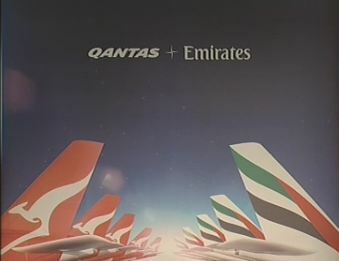 The code-sharing, profit-sharing, market-sharing partnership will see Qantas and Emirates offer a combined total of 98 flights a week between Australia and Dubai, but getting it literally off the ground hasn’t come quickly or easily. 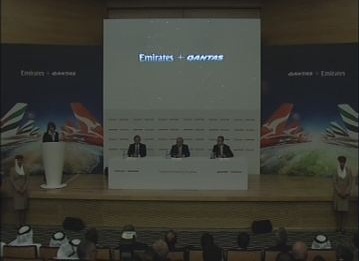 The President of Emirates, Tim Clark, says they were supported at every step by the Australian government. Of course the Minister would realise Australia has a lot to gain from the partnership, especially with enticing images like yesterday’s double flyover in Sydney being beamed out around the world, but he’s also thinking about expat Aussies, like the 7,000 odd-of-us estimated to be living in the UAE. Australia’s Minister for Infrastructure and Transport , arrived in Dubai on the flight. “Australians are of course amongst the most travelled people on the globe,” said Anthony Albanese. Also present at today’s event, the Australian Ambassador to the UAE, Pablo Kang.